DIFFERENCE IN YOUR FALL HUNT! It’s not just our Jarrett Tri-Lock Receiver, Jarrett hand-lapped barrels, and Jarrett stocks that create Jarrett accuracy; it’s our custom Jarrett ammunition, too! 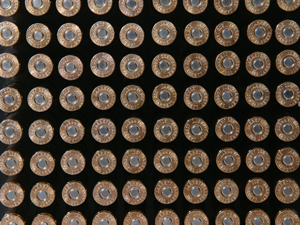 “Whether you’re out for deer, elk or most of the African animals, .300 Jarrett is the our flagship cartridge . . . The definition of accuracy is a Jarrett Rifle! Share the wisdom of Webster’s with your friends at the range with this snappy black or gray T-shirt. 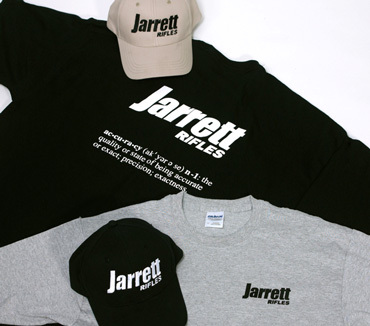 It’s subtle, but it’s the right thing to do: Choose an understated Jarrett Logo Shirt that let’s everyone know that when you shoot, it’s a Jarrett! In gray or black. Hats Off to Jarrett Rifles! Adjustable ball caps in all your favorite colors with your favorite rifle’s logo! In black, khaki, camo, dark green, driftwood and dark brown.